But why develope our own, when we can just ask to borrow yours really nicely if we had to. You know cup or sugar, an egg or two and some of your birds. I wonder if anyone (Lockheed Martin UK and Leonardo) are looking at possible sales of Crowsnest to Spain to replace their AEW Sea Kings? If so they would have to look at integrating it with non Merlin platforms, so why not a USMC type? Whatever happened to the AW101 replacement of the Presidential transport? An Irish radio station from Cork. Google it. "F-35 will never fly" vs "F-35 has flown x thousand sorties", "F-35 will never fly on operations" vs "F-35 on operations", "F-35 will never operate from a ship" vs "F-35B and F-35C routinely flying from ships"...... and so on. Or the Japanese - already an AW101 operator, and looking to take F-35B onto ships. Pork. It was hoofed for the S-92 (which has had a troubled gestation but... it has a big 'Made in the USA' sticker on it). The USMC aren't particularly interested and, if they were, the E-2D community would stifle it (again) for fear of it diverting money from their Programme. Remember, it's the USN who own USMC budgets and they've just committed to additional Advanced Hawkeyes. I would agree with @Cold_Collation however that the Japanese would be a more realistic future Crowsnest operator, particularly given the size of the JMSDF and the fact they already operate AW101. However, we also need to remember that the Italians have also developed an (much moer aesthetically pleasing) AW101 AEW variant. However, I suspect it's FIAR radar is less capable than that of our Crowsnest. Cancelled years ago and the VH-92s which were bought instead are undergoing final OT&E over DC prior to entering service. "Delays and engineering issues plagued the VH-71's development. By 2007, the estimated cost of developing and modifying the aircraft had risen by 40% to $2.4 billion and had passed the $4.2 billion expected for the production of the fleet. In March 2008, the program cost had risen and was projected to cost a total $11.2 billion, or about $400 million per helicopter. " I suspect that pork-barrel politics ensured that every obstacle possible was placed in front of AW until costs had risen to the point that it was non-viable. AW originally won the order. Then there were shenanigans over what exactly had to go into the airframes ("Top Secret comms gear because we're carrying the President", etc.). In effect, like the USAF's tanker order, pork made sure that that best horse came second. The VH-92 is not without problems. For one, it can't land on the White House lawn without shredding it. Yes, you have to wonder. However, we also need to remember that the Italians have also developed an (much more aesthetically pleasing) AW101 AEW variant. However, I suspect it's FIAR radar is less capable than that of our Crowsnest. In the spirit of FIAT ("Fix it again, Tony"), FIAR = "Fix it again, Riccardo"? We too had a more aesthetic suggestion: fitting of an F-35 radar each side of the AW101. Shifting target. From publicly published reading, let's just say that there was a lot of frustration - "Tell us exactly what you need to put into it"... "Ah, we can't. It's a secret." Not just mass but power draws, etc. As long as we are besties a phone call is going to be much cheaper to borrow you folks. Just as I suspect you will do the same with some of our people and assets. I hear the USMC loves the QE class platform, so Imagine them trying to deploy on it frequently. God help you all. I would also imagine the QE has a respectable rotary wing capability. So maybe one day the US Army might try to borrow it and play. 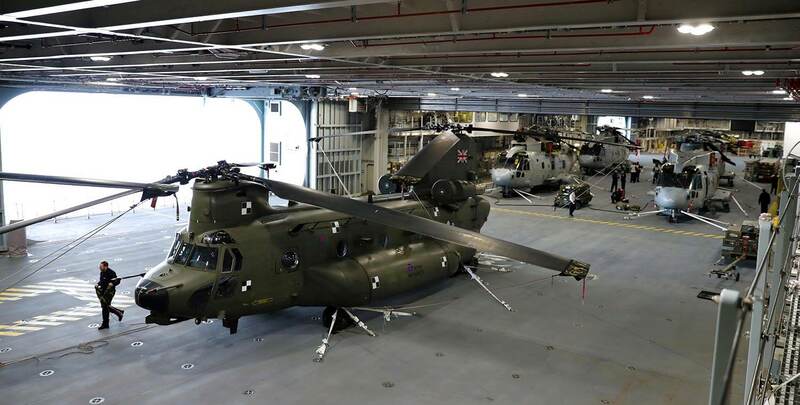 If push comes to shove I am sure an Air Assault trained infantry battalion could operate from its decks, if the Semper’s don’t have any bodies. I think that's pretty much a given, particularly with F-35B. Does this mean you will rename the 2nd ship? You could call her the HMS Chesty Puller, and Marine aviation would have a hard on for the ship! I would also imagine the QE has a respectable rotary wing capability. That's a bit "tight" !! I'd have second thoughts, parking a 10ton "Knocker" like that - never mind a "Wokka Wokka" . I saw the two so-called "aircraft carriers" today, and not a single aircraft in sight. I didn’t think either of them was currently deployed operationally. Come to think of it, isn’t one of them still being built? More to the point, the US marines are not supposed to be an independent navy operating in competition with the rest of the US navy. They are supposed to be operating in conjunction with the rest of the navy and not in a position where they need their own independent comprehensive air defence system with early warning. Their "landing ships" are not supposed to be "aircraft carriers". If they become "aircraft carriers", then that just argues for taking them away from the marines and giving them to the navy proper. It would make sense for the Japanese to buy Crowsnest, as it would be for their navy and not duplicating a function that someone else is already providing. More to the point the Lightning Carrier Concept is very much in line with USN thinking. The USMC total strike package complete with it own air-cover and 1st day strike capability is a potent Air/Land/Sea force that will be a particularly relevant asset in the S China Sea. We need to be a little careful before using such evangelistic language. It doesn't matter how many F-35Bs your LHA has embarked; it still won't have organic Air C2ISR or several other enablers (which even a CVN often has to look elsewhere for).